The following information came from an Environmental Impact Statement (EIS) prepared by Mn/DOT in the 1990s. Graeser Park, also known as the Robbinsdale Rock Garden Roadside Parking Area, is located on the northwestern side of Highway 100 between West Broadway Avenue and Highway 81. Graeser Park is the largest and most intact of these picnic areas. This park, like the others, was dedicated in 1939. 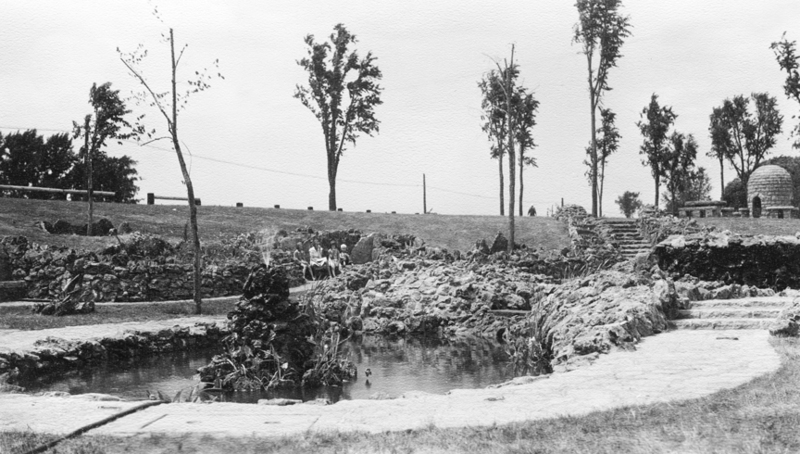 The park reflects the naturalistic landscaping and rustic architecture that characterized wayside parks constructed by the Works Progress Administration (WPA). In fact, the original plans called for a “Rustic Log Roadside Parking Sign,” emphasizing the camp-type feeling that was the goal of these parks. After its completion, Graeser Park rapidly became not only a popular rest stop for motorists, but a focal point for the Robbinsdale community. 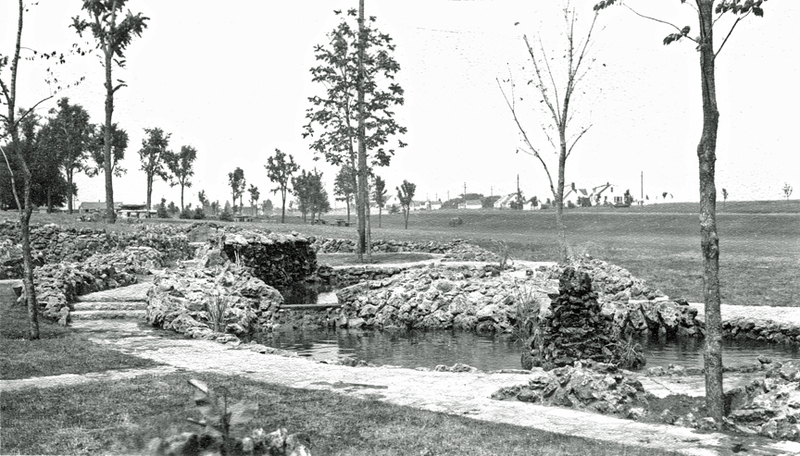 Sources indicate that Graeser Park was a favorite place for family outings and church and school picnics. The structures and the great majority of plantings are primarily clustered at the west and southwest sides of the present grounds. 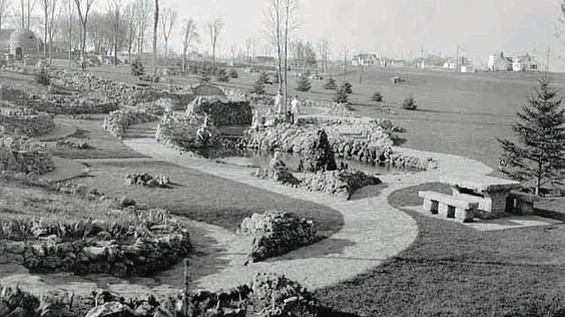 The park was originally planned to be about six acres in size; structures and vegetation were clustered to leave space to the east for construction of a cloverleaf interchange. The cloverleaf was never built, however, and a simple turn lane for free right turns was constructed instead. In 1984, this turn lane was realigned, and an area of grassy open space became contiguous to the northeast corner of the original park; the total area of original parkland and contiguous open space is about 9.8 acres. This new open space is not a contributing element of the park. 1. Overlook Wall, facing southeast. The limestone wall is 18 inches thick and curves to form a lookout bay, which is paved with flagstone, creating a terrace. Three sets of stone steps lead from the wall to the picnic area. 2. Ten Stone picnic tables. The original plans called for 18, and additional flagstone pads that indicate that there may have been 10-12 more tables at one time. They are grouped in three clusters. 3. 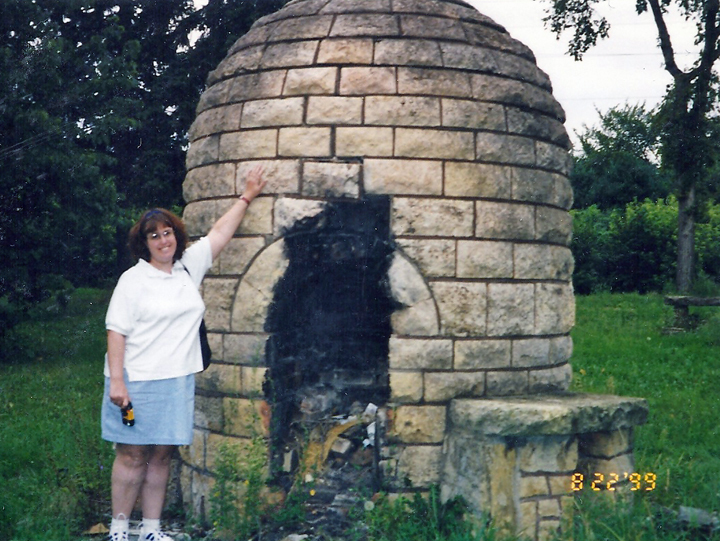 Stone beehive fireplace, 23 ft. around, about 10 ft. tall, with three openings with metal cooking grates and brick lined fireboxes. Between the openings are handy limestone ledges. There were also originally three “table type” fireplaces. 4. Stone curbing in the parking area, which accommodated 20 cars. 5. Rock garden near the southern end. 12 flagstone steps lead up to it. The garden has curved paths paved with flagstone, with some limestone steps. The path winds around mounds of stone. Along the pat there are four niches with benches. Near the center are two oval ponds that were about 3 ft. deep. One pond has a conical fountain made of stone in its center. The other pond has a waterfall along one side. 6. Stone culvert, near the southern edge on the shoulder of the highway. Built of limestone, it has a circular iron culvert running through it. 7. Stone stairway leading from West Broadway Ave. into the park. This was removed in the 80’s when Broadway Ave. was widened. 8. Three stone refuse containers (square stone structures apparently meant to hold a metal can). Parking for several cars is available on Scott Avenue (above the arched wall). All other access to the site is by pedestrian walkways on local streets. The site offers no specific recreational activities other than picnicking. Only two usable picnic tables remain out of 10 original stone tables; the unusable picnic sites have been vandalized or neglected and are missing parts of the stonework. The beehive oven provides evidence of recent use, although the time and amount of use cannot be determined, and there are no grates. Graeser Park South, also called Graeser Park II. This is a 1.7 acre open space with some trees on the west side of Highway 100 bounded by the Burlington Northern Railroad, 100, and Scott Avenue. It is on a triangular piece of land that extends down Highway 100 to the southwest. It was completed in 1940 or 1941. 2. Stone picnic tables. Although all were gone, there were originally at least five or six picnic tables at the site, arranged around the Council Ring. 3. Stone fireplace; original plans called for three. 6. Pump with pump shelter. Graeser Park South is physically separated from Graeser Park by West Broadway and the railroad, and is fully within the Highway 100 right-of-way. The circular bench/bonfire pit has been totally overgrown with weeds and debris has been deposited inside. Access to the site is provided by Scott Avenue, and it is likely that most users of the site are pedestrians in the immediate neighborhood. While this area is located within the limits of the Lilac Way Historic District, the Cultural Resources investigation did not highlight this area as a specific contributing element of the historic district. Rather than being considered an independent park facility, for the purposes of the EIS, it is considered to be simply open space that is part of the overall landscaping for the area.